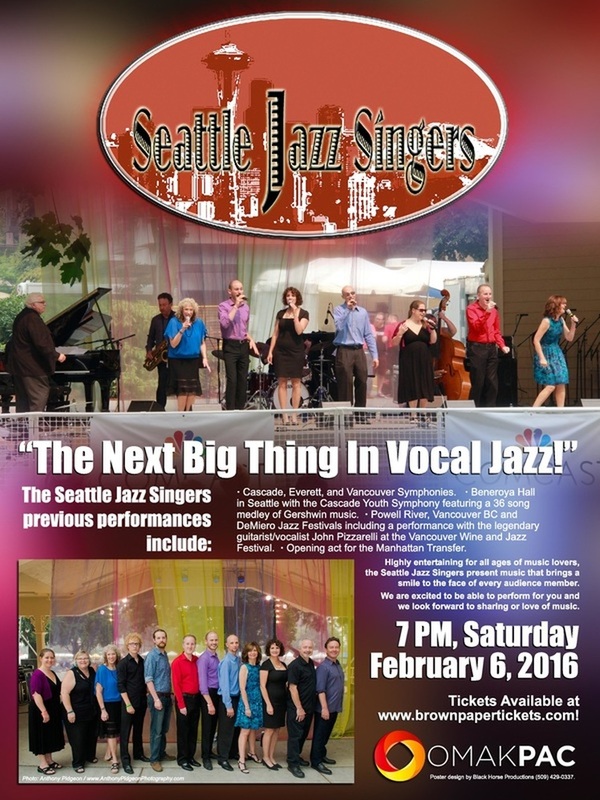 Considered one of the most exciting vocal jazz ensembles on today’s music scene, Seattle Jazz Singers, are performing new renditions of musical standards as well as introducing new an innovative vocal jazz styles. SJS exemplifies the excitement; spirit and growing enthusiasm for America’s only true art form, the music of JAZZ. Since the group first appeared on the music scene at a benefit concert, they have been in great demand, performing at schools, universities, jazz festivals, major concerts and jazz clubs throughout the Pacific Northwest. Performances have included guest artist appearances with the Cascade, Everett, and Vancouver Symphonies. A performance at Seattle’s Benaroya Hall with the Cascade Youth Symphony featured a 36-song medley of Gershwin compositions. Performances also include guest artist appearances at the Powell River, Vancouver BC and DeMiero Jazz Festivals including a performance with the legendary guitarist/vocalist John Pizzarelli at the Vancouver Wine and Jazz Festival. Under the direction of Frank DeMiero, SJS continue to be a constant hit in performances at places like the world famous Jazz Alley in Seattle, Patty Summers, Jazz in Bremerton, as well as schools and universities. Special performances have been given at the Northwest American Choral Director’s Jazz Night concerts and for civic and community charities. SJS recordings include three CDs, Love Bein’ Here With You, Down At Smoky Joe’s and Thought About You. These CDs feature the music and arrangements of some of the greatest composers and arrangers on the world’s jazz scene. Dave Barduhn, Anita Kerr, Larry Lapin, Roger Treece, Ken Kraintz and Ginny Carr… to name a few. The versatility of SJS is evidenced through their recordings and solo performances by each of the individual members. Each SJS member is considered to be a talented musician. SJS is an exciting and entertaining ensemble filled with the joy of improvisation, the passion of sharing an emotional ballad, and the energy of a straight ahead swinging chart. Highly entertaining for all ages of music lovers, SJS presents music that brings a smile to the face of every audience member. We are excited to be able to perform for you and we look forward to sharing our love of music.